Is it worth visiting the famous Benagil Cave in Portugal? Absolutely. Benagil Cave Algarve is a particularly stunning part of the Algarve. My trip to Benagil Cave Portugal was my favourite thing I did while I was in the Algarve. 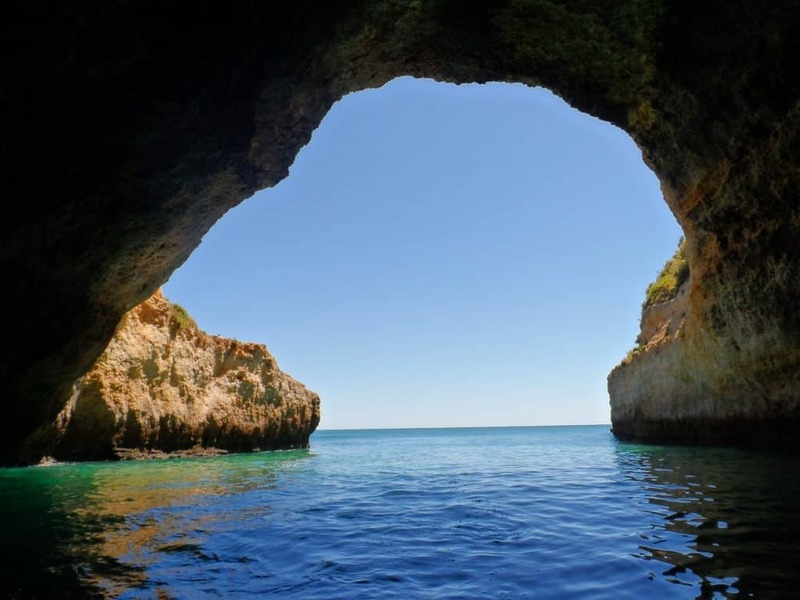 There are a lot of beautiful beaches near Lagos but the Benagil Sea Cave is the highlight of the Algarve. Algar de Benagil, its Portuguese name, is spectacular inside the cave with the sunlight streaming through the roof and the golden sand and beautiful azure waters. It is a natural wonder of the world and pure travel inspiration for those who have not been. This part of the world has a lot of rock formations along the coast. Where is Benagil Beach Cave – Benagil Sea Cave Location? Benagil Cave is located along the coast next to Benagil Beach (Praia de Benagil), in the Algarve Portugal. 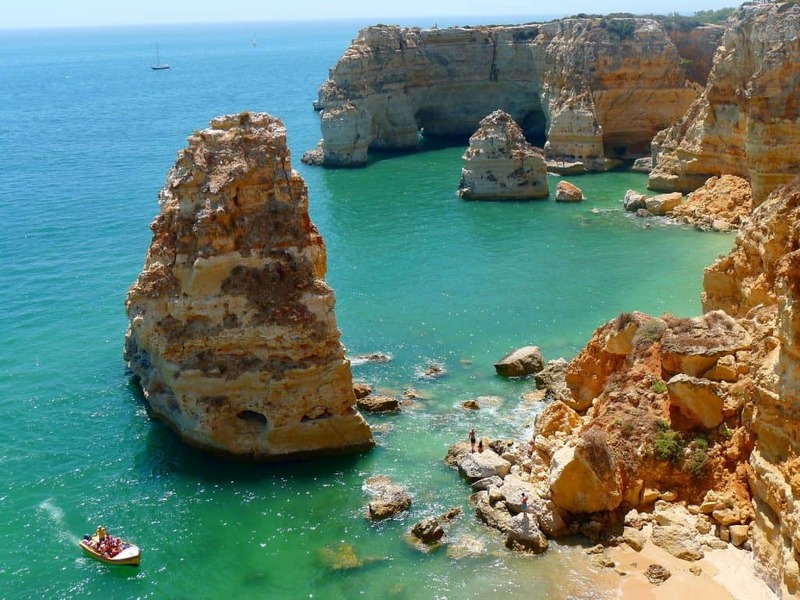 The closest cities are is Portimao, Albufeira, Carvoeiro and Lagoa. 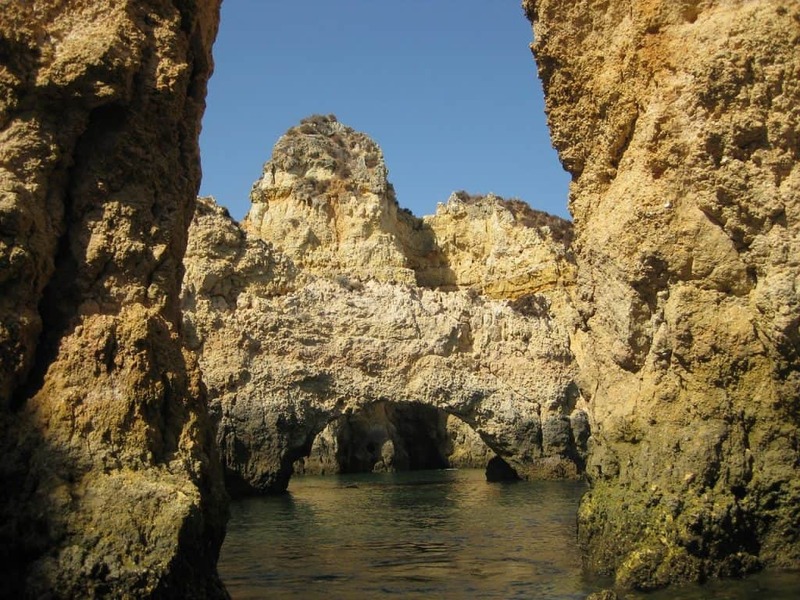 Benagil Cave is about a 40 minute drive east of Lagos or as the map shows a 15 minute drive from Lagoa. See the map below for the exact location. How can you get to the Benagil Cave Algarve Portugal? There are several ways you can visit the Benagil Cave and Benagil Beach. I recommend taking one of the Benagil Caves boat tours to get there. The cave can be visited any time of year. Swim – from Benagil Beach you can swim approximately 200 metres to the Benagil Cave. You must be a strong swimmer to reach the cave. The tides and current change quickly here and I recommend a life jacket or lido to make it there. I actually do not recommend swimming here but I have seen some people do this. Drive – you can actually drive to Benagil Cave. You will only be able to view the cave from above and look down at the beach. You can walk up to the hole in the ceiling of the cave and see it from above, but there is no way to get to the cave itself on foot. It is cool to see the cave from above and if you are visiting the beach it is worth a look. Then you can take one of the Benagil Cave Tours to go into the cave from below. Kayak or Paddle board – You can rent Kayaks or Paddle boards for about the same price as a sea boat tour if you want. Its a cool idea but I think for the price it is so much better to take the tour as you will see more of the Algarve coastline. Take one of the Benagil Cave Boat Tours. This is the best way to visit the Benagil Caves. It is the safest and best option as you will visit other caves in the area on the boat trips. 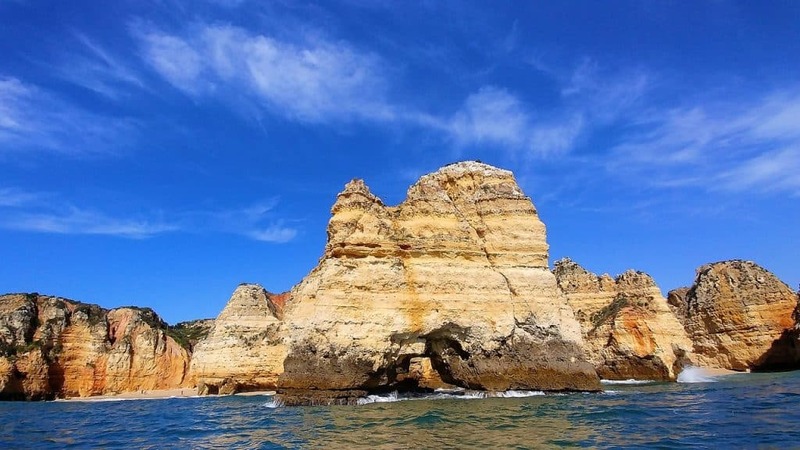 What’s the best way to see the Benagil Sea Cave Portugal – Take a Benagil Cave Tour! 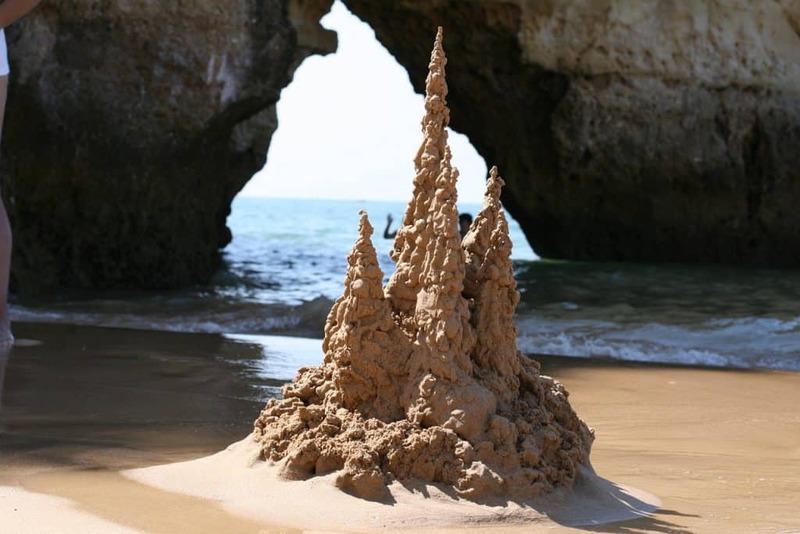 Most people will leave from Benagil Beach or one of the surrounding cities in the Algarve to visit the caves. It is right next to the beach if you are looking for a direct boat tour to the caves. I highly recommend taking one of the Benagil Cave Tours to visit the Benagil Beach Cave. These tours leave from Benagil Beach, last 2-3 hours and cost anywhere from 30-40 Euro. I cannot recommend one company over another as they are all the same. You can ask at your hotel which one is best for the activities you want to do. Remember these tours are not just to Benagil Cave, that is the icing on the cake, but they are along the coast where you will see lots of different caves. There are many different tour companies offering trips to the sea caves. My suggestion is to go early as it gets quite crowded later in the day. You will be amazed how many more boats you will see the closer you get to the cave. You will want to take one of the smaller boats as this means there will be less people on the boat and they are also faster. So less time in the boat with fewer people and more time in the cave! Some of the tours combine the sea caves along with dolphin watching which is well worth it as well. I flew into Lisbon and spent a few days there before taking a bus to Lagoa (not Lagos). The bus takes three hours and costs around 30€. You can also take the train but this takes the same amount of time and costs a little bit more. From Lagoa you can take a 15 minute taxi ride for 10€. I then took a boat tour from Benagil Beach to the sea caves. 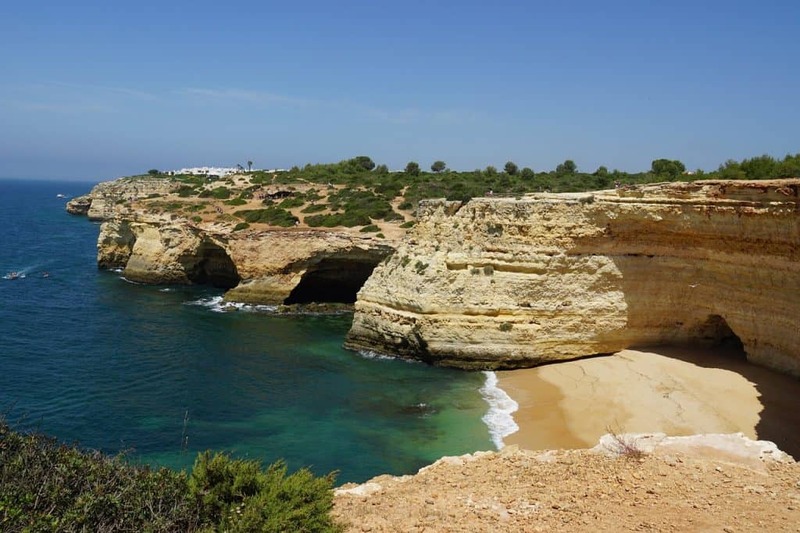 Please note the tours also leave from Lagos, Portimão, Albufeira and Vilamoura. My tour lasted about two and a half hours. I mentioned before that some parts of the boat ride were quite rough but it was never scary or dangerous. I went first thing in the morning and we were one of the first boats to the sea cave. Once inside it was absolutely beautiful. I took a few pictures and it was time to go again. When we were leaving the cave there were quite a few boats lined up to come inside. As the entrance is quite narrow and the cave is not huge it gets quite congested waiting for boats to leave so others can get in because it is just not big enough for all the boats. This is also why I think some boats do not allow you to get out of the boat once inside. It is a timing thing where they want everyone to be able to go inside. After the cave we spent our time going along the coast checking out the beautiful coastline. The views inside the cave are absolutely beautiful – even with all the people there. There is some conflicting information about whether or not you can actually get off the boat when you get inside the cave. I was able to get off the boat in 2018 and I have heard of quite a few people who went in 2017 and were able to get off the boat and go to the beach inside of the cave. I have read recently that this is no longer possible. I am wondering if this is being left up to the boat tours? Are they trying to get in, let you click, click and then want to leave again so that more boats can get in? As there was quite a line of boats waiting to get in this made me wonder if it is because of the sheer number of people going. You will definitely have a better chance of stepping foot on the beach in the off season compared to the middle of summer when everyone is on holiday in the Algarve. Something to think about when you go. Practical Information about Praia de Bengali or Benagil Beach Algarve and Benagil Sea Cave – Grutas de Benagil. You will want to go early in the morning to the Benagil Sea cave to avoid the crowds. The boat tours take 2-3 hours and are cheaper in the off season. The beach is also know as Praia de Benagil in Portuguese and you will find the cave under grutas de Benagil. You can go out for the morning on the boat tour and then spend the afternoon at Benagil Beach and pack a picnic to make a day of it. To get to the beach you need to go down a steep walkway to get down to the sand. The sea can be quite rough which makes the boat ride quite bumpy. As it is such a short ride to the caves I would say it is worth it. Also, it is only rough in certain places and the driver can always take breaks as well. My driver liked to turn and spin the boat and get us wet. No problems with that I brought my wet seal for my camera so it was well protected. I use a mirrorless camera so I wanted to protect it. I wish I had taken my gopro to use as that is water safe. Ensure you wear sunscreen and apply it before you even arrive at the beach. Also pack plenty of water and snacks. I actually wore my swimsuit under my clothes and brought my towel as well as we were able to swim along the coast. There are many restaurants located along the coast if you want to stop for lunch or a snack. Most of the restaurants have beautiful sea views and fresh seafood. What do you think? Anything to add to this Ultimate Guide to Benagil Beach? Sharing is caring. Feel free to pin this image to save it for later when planning your next trip to the Algarve Portugal. Great tips!! Avoiding the crowds is always a good idea. Would love to go here one day, saw many cool pictures of it recently on Instagram. Yes, avoiding the crowds is always my number one thing! This place is a paradise. I couldn’t fit it on my last trip to Portugal, but sure it is a priority next time! Love how you explained this adventure, thanks for sharing! It really is paradise there. Such a beautiful place. The pictures are so alluring.. they make you want to visit the place. Though Portugal was not not in my travel, I can now think about it . Portugal is one of those places that doesn’t always make the list but it should! Thanks. I wanted it as detailed as possible so people knew how to get there. This place looks amazing! That beach is to die for – your photos are really beautiful. Thanks for the awesome guide. Yes! This is on my list of things to do in Portugal so I super appreciate you writing this post. Thanks to your tips I can easily check this one off of my list! It looks very beautiful! Very detailed post about how to get there, what to do, other things in the area! What a picturesque view..looks like a real paradise..i loved all the pics..never heard about it earlier.thanks for sharing the info. Such a beautiful location, your photos are stunning. Its good to see that its not completely overrun with visitors. In a way I don’t mind not being able to get off the boat if it preserves the beauty (though I would love to of course). Its great that you were there at a time that you could explore the beach inside the cave a little too. Thank you for effortlessly adding a new destination in myb my bucketlist! Your photos are breathtakingly beautiful! Fabulous guide here Nicole. I love the look of these caves. So unique. Definitely a movie set worthy spot if you ask me. Thanks for sharing with us. It’s one of those sites I often see on instagram / other social platforms but not thought to plan a visit. Great advice on the relative risks and merits of driving, swimming, kayaking or taking an organised boat tour. I think swimming is definitely a bit risky given the currents! It’s interesting that you may not be able to get off the boat, I can understand why from a logistics perspective and perhaps the interest in the cave has increased, meaning they need to reduce access to allow for that? Beautiful photos. 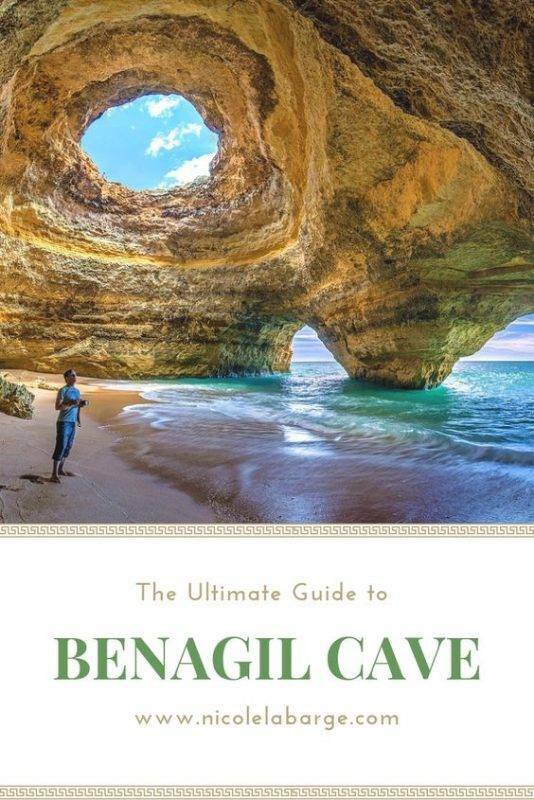 We spent a month in Portugal and never heard of Benagil Cave. How great to add reasons for a return visit! We saw so many great cliffside in the Algarve. But it looks like we missed something spectacular. A boat tour seems like a smart suggestion to get to this spot. But a kayak might let us explore on our own. I would hate to get there when the boats were lined up to see the cave. So your early morning suggestion will guide our visit. Definitely a spot for our return visit to Portugal. Wow, what a stunning place! I’m going to Portugal next year and this is definitely on my bucket list now. What a beautiful place! Stunning photos! The blues of the ocean and the orange of the rocks, it looks like a movie! Thanks for sharing information on how to get there. I would try swimming but it sounds more dangerous than it’s worth. I hope the rules on getting out of the tour boats and onto the sand is settled, I’d hate to miss the chance to see the caves up close. I’ll definitely make sure to get there early to beat the crowds. Thanks for the inspiration! Stunning site! I am now pissed that I didn’t push through with my trip to Albufeira. I had already booked a hotel in Brussels before they emailed me that one was ready in Portugal. Darn! This cave is stunning! Wow you must be in awe seeing the cave in person! The pictures look stunning! I must try visiting on the off season then so I can get a chance to get off the boat inside the cave. I also wanted to try viewing the cave from above. The view looks breathtaking from the pictures. You captured it so well! Thank you for sharing your guide of this treasure. I will surely use your infos when I visit Portugal. That hole is just perfect, like a peep hole to the sun. The waters are so blue and green. The rocks look like ruins of a large castle. Sounds like renting a kayak and going on your own is the best option for avoiding the crowds, plus (unless the cave beach is off limits) you have the option of getting out and going inside on the cave beach. I also love kayaking and you could see a lot of the coast depending on your paddling ability. I have seen pictures of this place all over Instagram! It’s nice to read more details about Benagil Cave and how to get there, and from which city. I’d love to take a Benagil Cave Tour. Have been planning a Spain & Portugal road trip for 2019 and this will be a great addition to it, thanks! Beautiful, Portugal is really spectacular. I saw this place on many outdoor wedding photoshoots – I have a website on destination weddings in Portugal. Beautiful place. Oh my I can only imagine having your wedding photos taken here. Incredible. Fabulous photos! 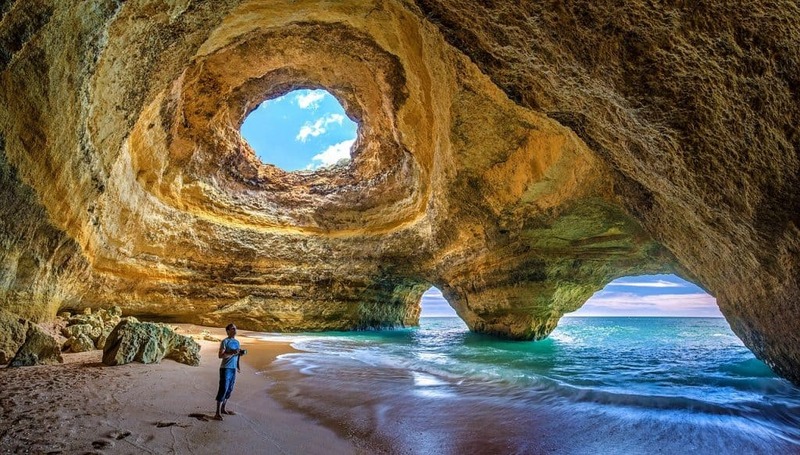 Benagil Cave looks like a place not to be missed when visiting Portugal. It looks so stunning I’m guessing it must be one of the most instagrammable places in Portugal? You gotta be kidding. I just looked on the map to see where this place is and its about 20 minutes drive away from where I was staying there a few years back! I didnt even know about this place while I was there. Sigh. But I hope to be back on the Algarve soon so hopefully I will check out the cave. Have bookmarked this page for reference. Wow.. The Benagil Cave is definitely going to my bucket list! It looks really gorgeous and your photos are stunning! Great post and very comprehensive. Your tip on taking the smaller boat to the cave and doing it earlier in the morning is very practical and helpful! I was just staying in Alvor last week. Unfortunately, we had 2 tropical storms while we were there! so no boat trips for us . 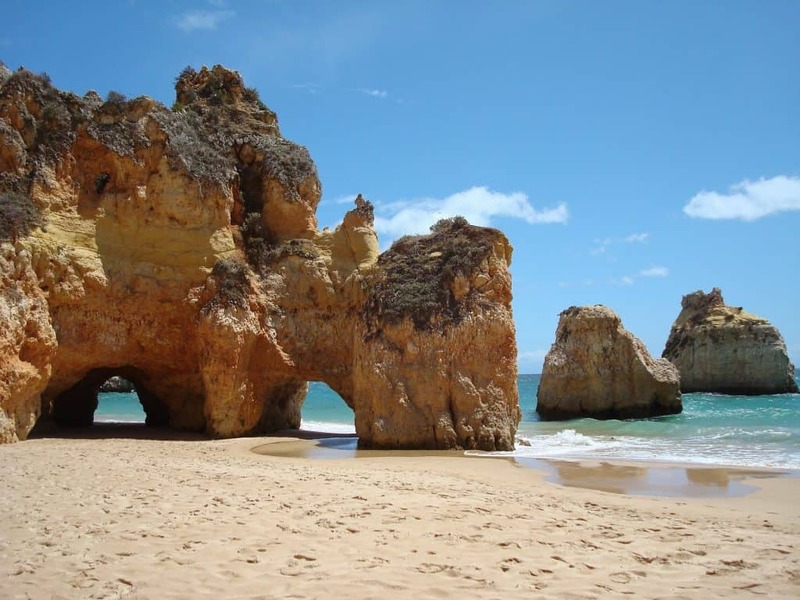 There are similar rock formations and beachs near Alvor also which were stunning. We went in the evening and we had the beach to ourselves. Benagil Cave looks so magical. This seems to be a relatively off-beat place. That explains its pristine charm. Definitely a place after our heart. The caves, the sands and the azure waters seem to work a spell on you. An early morning visit should be a very fulfilling and rejuvenating experience here. I remember seeing photos of this awhile back and wanting to visit so badly. Super glad I came across your guide as I must say, this is the most detailed one I’ve seen yet! Thanks for all the travelling/direction tips and good to know there are awesome restaurants around the area too! I am so gutted as I was so near to Benagil Cave a few months ago! I didnt even know this place existed and now I seen this post and photos, I want to check it out. Hopefully as a regular visitor to Portugal I will hit the south coast again soon and check out the cave. The caves look absolutely fabulous. I have seen hundreds of photos but didn’t know they belong to this cave! The color brown & greenish blue is great combination too. I would love to visit this using a kayak. It would add some thrill definitely. Absolutely magical & off the beaten path.